About: The meatloaf at Dukes is a favorite among the diner's devotees. Not fussing around with a classic, Chef Sanchez uses a familiar recipe that incorporates ketchup, Worcestershire sauce and oatmeal. 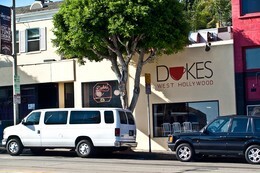 Full of flavorful sauteed vegetables, Dukes serves it with traditional mashed potatoes and gravy. All homemade and all delicious, the flavor of it instantly conjures up that emotion of something familiar. This dish is of European origin and dates back to the Fifth Century and in the most basic form, its cousin would be the meatball. Traditionally this is a German or Belgian loaf but almost every culture has its own take. In Greece, it's served with hard boiled eggs on the inside. Saute onions, peppers and garlic for one minute and set aside to cool. Mix chopped parsley, eggs, and ground beef with the above mixture. One cup at a time, mix the oatmeal until the consistency is firm but not hard. Add ketchup, Worcestershire sauce, salt, and pepper. Form into three large balls and top with more ketchup. Bake at 350 for about an hour or until cooked through.